The application I’m maintaining is on the Internet and uses SharePoint 2010. Configuration is automated with a bunch of scripts and I have therefore extended our existing “script infrastructure” with this warm-up script, thus this may seem somewhat overkill for your needs. In the Post-SharePoint-Installation-Scripts folder we have one folder that holds the environment specific settings and one folder for general helper scripts as shown below. 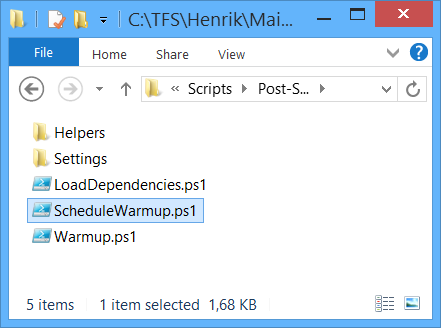 I have cleaned up these folders from the scripts aren’t relevant for this blog post, but what they have in common is that they load the LoadDependencies.ps1 file that loads the needed helper scripts and settings for the current environment (like dev, test, prod). The help script I have kept in the Helpers folder is the Security.ps1 from the Carbon package to check for administrative permissions. Examples of the settings files look like the following. Having the account that will run the scheduled task in the environment specific files enables you to have different accounts for each environment if your site requires authentication. All the environment specific variables have the Env prefix as a naming convention in our scripts to avoid confusion where they are used. The file path to the warm-up script is where you want that script to be when the job is set up, so you can delete the supporting scripts folder later if you want to. Write-Host "Setting Prod environment Properties"
Write-Host "Setting Dev environment Properties"
$HelperScriptsPath = $ScriptPath + "Helpers"
Write-Host -foregroundcolor red "Must specify environment : dev|inttest|at|prod "
Write-Host -foregroundcolor red "Possible values: dev|inttest|at|prod"
$tmpPath = $ScriptPath + "SettingsSettings_" + $targetEnv + ".ps1"
Write-Host -foregroundcolor red "Specified settings file '$tmpPath' does not exists." $helperSecurityScript = $HelperScriptsPath + "Security.ps1"
Write-Host -ForegroundColor Red "Specified file '$EnvWarmupScriptPath' does not exist." # want to hit in a text file and load them from there. # as a scheduled task without parameters. $trigger = "*[System[Provider[@Name='Microsoft-Windows-WAS'] and ((EventID &gt;= 5074 and EventID &lt;= 5081) or EventID=5117 or EventID=5186)]]"
$jobName = "Our Great Service IIS Warmup"
The trigger doesn’t look for IISRESET and doesn’t look for a specific application pool, so feel free to add that to your script. Now we can copy this folder structure (in the screenshot above) to any of our web servers and easily keep the sites warm (it’s snowing outside my window), even our dev environment if we want to.